As you read Slop, you'll hear odd words bandied about. Some of them are species. Others are place names. Some are just plain weird. Wonder what a Vepr is or just what a turnip mangle might be? As the comic progresses and new words are introduced, I'll try and add new entries below...and maybe some pictures. Anyways, keep a look out. blackmouth - Short for Black Mouthed Cur...a common nickname for the black muzzled, yellow canine sentients in the SLOP universe. In some areas the yellow dogs out number the more pure formed coyote, wolf, and fox morphs. This is what happens when the canine races mix their blood freely back and forth. BMC's don't always have a black mouth but the muzles do tend to be darker. The fur can range anywhere from dark brown, black, or even white. Ears can be perky or droopy and soft. 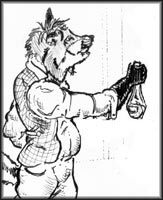 Brock - One of the mustelid races originally from the European continent. 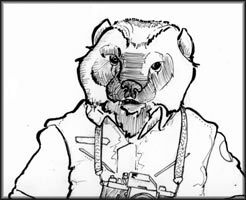 Brock are physically similar looking in color pattern and stock build to the Eurasian Badger. Brock may interbreed with common success with the other common mustelid sentients. 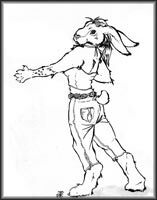 Coronado - one of two basic caprine races. Coronado are usually white though interbreeding with the other goatlike race produces offspring that often mottled black and white. Coronado males are known for their large set of thick horns. Females also have horns but a much smaller, shorter pair. 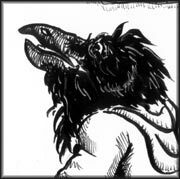 Corvinka - the feathered, crowlike race of sentient avians in SLOP. Corvinka have a taste for finely aged (spoiled) meat. They cannot fly nor do their brains seem to possess any sort of flying instinct. Corvinka do not on average make better pilots than other races. Corvinka legends do speak of a child born with perfect and strong wings that will lead the Corvinka to the promise place in the sky. There are no other avians in the SLOP universe though fossil records show there used to be at least three others. 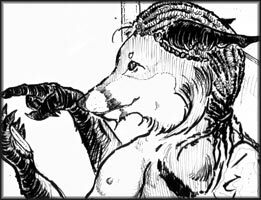 Coyono/Coyana - One of the many canine appearing races, coyano are genetically similiar to coyotes. They can freely interbreed with the other canine races. They are generally already a mix of their coyotelike ancestors and their later more Vilken conquerors. Coyano tend to be a little smaller then more wolven races. Adult males are refered to as Coyonos while adult females are refered to as Coyana. 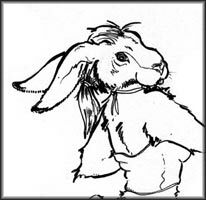 Cunni - A race of rabbit like sentients native to North America. They have the coloring and basic looks of wild rabbits. The cunni peoples were nearly wiped out by canine settlers. There are three cunni reservations and politically the tribal cunni still lobby for a truly independant state. Fel - One of two cervid races. The Fel are most similiar to white-tailed deer of North America. Females do not have antlers. The males of course do...at least for part of the year. Yearly, they shed and regrow their antlers the same way quadraped white tailed deer do. 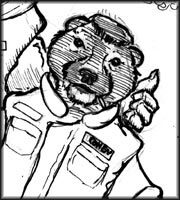 Fitch - the lithely built, ferretlike race of sentient mustelids in SLOP. Fitch come in different ethnicities based on minor physical differences and color patterns. All fitch can interbreed. Some females of the species suffer a metabolic problem that can kill them if they do not reproduce within a certain time. 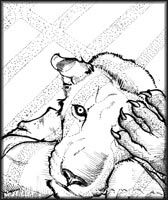 Grip - A corruption of Grypt, the older name for a nomadic, sheep herding group canines. 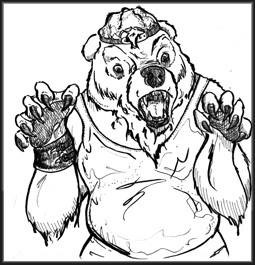 Grip has negative connotations and is often used as an insult by some for any working class canine that has a physical appearace that differs from wilder looking canines. True Grip look like border collies. The grip further self-segregate based on if you have high blood or low blood. 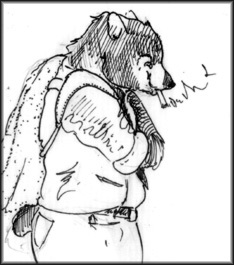 Hahursa - A races of ursine people of SLOP. European descent harhursa tend to have black coats.North American descent hahursa have brown and somtimes almost blonde coats. Mong Cai - A piglike race of sentients common to Asia and Asian minor. In the Thaikong War, a large faction of Mong Cai were trying to overthrough the imperial Tag governement of Thaikong. They can freely interbreed with Veprs. N'buwalda - Originally out of the African basin, the N'buwalda might at first glance look canine but are actually related to the Spotted Hyena, to which they bear a strong resemblance. There are a lot of urban legends about the N'buwalda, some of which are actually true. Old Bear Black - A dark dark porter type beer made by Old Bear Brewery. Old Bear Brown - The more mild, lighter pale ale type beer made by Old Bear Brewery. Oroslani - A species of sentient lion native to Eastern Europe. The oroslani once had a vast Empire from Eastern Europe and into Asia. Unlike previous empires, they were not builders of infrastructure and services. They demanded year tributes and provided little in return other than a cessation of aggression. 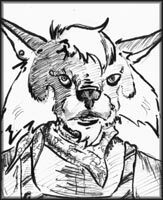 Reynard - Small, and lithe, the Reynard people are a canine race that bear a resemblance to red and silver foxes. While able to sometimes interbreed with the rest of the canine races, the offspring are usually sterile. 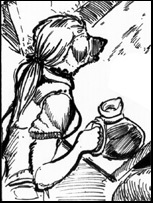 Reynard are generally thought of as the strongest smelling of all the canine races. Rudy Red - Made by the Roebuck Brewery, its a red ale. 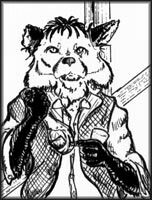 Sekakwa - Initially thought to be part of the mustelid races, the Sekakwa are a skunklike sentient race. Generally, they are de-scented shortly after being born because the ability to spray does not serve them as well as it does the wild skunk. Sekakwa children, prior to the days of de-scenting, were refered to by the canine settlers as Stinkininies. Children are prone to accidentally spraying when frightened or excited, saturating the clothing of said children. Shellers - Otterlike mustelids, the shellers while not fully aquatic are excellent fishermen and divers. They tend to inhabit coastlines. 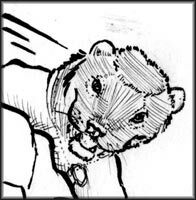 Shellers, like Tungka, do not easily interbreed with the other mustelid races. Singha - Another lionlike race, the Singha are from Asia minor. They do not have the thickeness of mane that Oroslani possess. There is an ethnic animosity between both Singha and Oroslani. 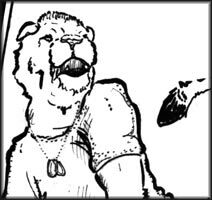 Tag - The tigrelike race that formed the ruling class of a lot of south east asia. Unlike the Oroslani who built a spanning empire, the Tag many smaller kingdoms. Prior to the socialist revolution, the Thaikong government had been composed almost entirely of Tag. 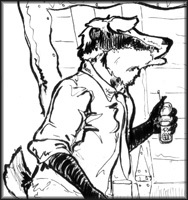 Todd - Similiar to the Reynard to the point of being nearly indistinguishable, Todd are Reynards from the British Isles. 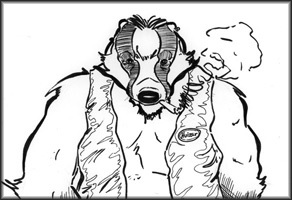 Tungka - a mustelid race native to North America that bears a close resemblance to Wolverines. Tungka were never truly conquored by canine settlers but eventually signed a treaty of unification with the Federated Union of States. In the nation further north, the Tungka have their own independant province. Tungka are trypically no taller than five feet and tend to be very broadly muscled. Vepr - The name for one of the three pig related races. Veprs are the largest of the three with the males sometimes standing nearly seven feet tall. As a result, any large male porcine wether he's actually a vepr or not is often called one. Veprs range from blood red to brick brown with the occasional black. 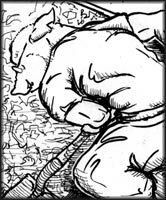 Of the three pig related races, they tend to be the most animal-like of all of them in terms of behavior. 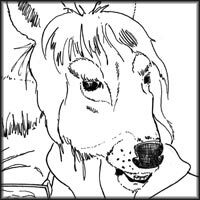 Vilkin - Similiar to wolves in apperance and tendency, the Vilkin or Vilkas are the collective name for most of the more wolf like sentient canine races. Wessig beer - a slightly bitter pilsner made by Wessig Company. 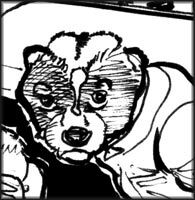 Weekahsah - Native to North America, Weekahsah are sentient race related to raccoons. Weekahsah have no other sentient races they can interbreed with.